Break away from your worries and fears, and learn to live with courage and hope. We know Jesus tells us, “Do not be afraid,” but with everything going on in the world, how is it possible not to be anxious? In this five-week study based on his book Unafraid, Adam Hamilton explores the worries and fears most of us experience. Your small group can learn to identify fears and discover practical steps for overcoming them…all in the light of Scripture and a faith that promises again and again that we can live with courage and hope. In addition to the Leader Guide, which includes session plans, activities, and discussion questions, a DVD featuring Hamilton, a Youth Leader Guide, and a Children’s Leader Guide are also available. The five-session DVD features Adam Hamilton presenting to a group in his engaging style. The video segments are approximately 10–12 minutes each and, when combined with the book, make an ideal five-week group study. All videos sessions are closed captioned. We know Jesus tells us, “Do not be afraid,” but with everything going on in the world, how is it possible not to be anxious? In this five-week study based on his book Unafraid, Adam Hamilton explores the worries and fears most of us experience. Your small group can learn to identify fears and discover practical steps for overcoming them…all in the light of Scripture and a faith that promises again and again that we can live with courage and hope. 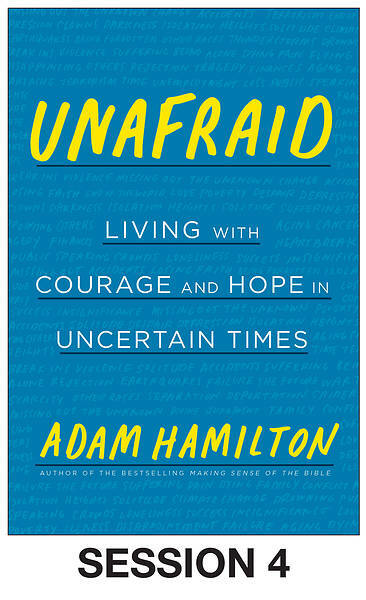 In video Session 1 titled Understanding and Countering Fear, Adam Hamilton introduces us to a discussion group made up of Carlos, Ginger, and Marie, three people who face fears just as we all do. 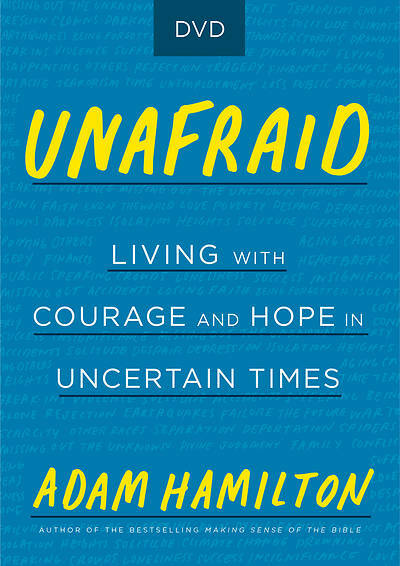 He introduces the subject of fear—how it is useful and how it can become a burden—and discusses fears of each group member. Afterward he talks with a neuroscientist, Dr. David Zald of Vanderbilt University, and asks how our brains play a role in how we experience fear. In video Session 2 titled Crime, Racism, Terrorism, and Politics, Adam Hamilton explores the question of how we overcome our fears of other people. He discusses strategies for confronting these fears with his guests, Carlos, Ginger, and Marie. Then Adam talks with Bishop William H. Willimon about why Bishop Willimon wrote his book Fear of the Other, and how our fear of the other affects our relationships and our society. In video Session 3 titled Failure, Disappointing Others, Insignificance, and Loneliness, Adam Hamilton discusses the fear of failure, loneliness, and rejection with his guests, Carlos, Ginger, and Marie. He also talks with Christian Cid, the CEO and President of the Serenity Counseling Center in Gallatin, Tennessee, about helping people overcome their fears. In video Session 4 titled Apocalypse, Change, Missing Out, and Finances, Adam Hamilton talks about apocalyptic thinking with his guests, Carlos, Ginger, and Marie. He also interviews Jerre Stead, who has served as CEO of several companies, about the role that uncertainty plays in business planning and business relationships. We know Jesus tells us, “Do not be afraid,” but with everything going on in the world, how is it possible not to be anxious? In this five-week study based on his book Unafraid, Adam Hamilton explores the worries and fears most of us experience. Your small group can learn to identify fears and discover practical steps for overcoming them…all in the light of Scripture and a faith that promises again and again that we can live with courage and hope. In video Session 5 titled Aging, Illness, Dying, and the Fear of the Lord, Adam Hamilton explores fears of death and illness with his guests, Carlos, Ginger, and Marie. He also welcomes his spouse, LaVon Hamilton, to discuss her own struggles with anxiety. Running Time: 15:22 Instructions: To stream a purchased video, login with your cokesbury.com user account, click on My Cokesbury.com, and select Downloads/Subscriptions.